Fifteen years ago Balmoral Park was thriving with nationally acclaimed horses coming to town for its American Nationals, a driver colony among the finest in the country, and nightly 1 million dollar mutuel handles the norm. Five years earlier the far south suburban facility took over as the Chicago’s circuit premier harness racing track when Sportsman’s Park closed its doors on the Standardbred industry as all of its major stakes events, from Super Night to the prestigious American National stakes, switched over to Balmoral Park, a former one-time “B” track for Illinois harness racing. The Balmoral driver standings in 2003 ended up with a Top Ten of Tony Morgan, Dave Magee, Ron Marsh, Tim Tetrick, Mike Oosting, Andy Miller, Ryan Anderson, Pat Berry and Dale Hiteman, in that order. This year only Ryan Anderson and Mike Oosting competed at Hawthorne’s summer meet and the latter just on a part-time basis. Homer Hochstetler was Balmoral’s 2003 leading trainer with Erv Miller and Ken Rucker close behind. Sadly, all have gone elsewhere and are now former Illinois based horsemen. The ten 2003 American National stake championships were spread out for the last time that season (late July to early September weekends). Beginning in 2004 American National Night was inaugurated as a single eight event gala night of racing with the 2-year-olds trots contested on another evening of racing. The combination of six figure purses plus the long illustrious history of the American Nationals always lured many of the nation’s elite trotters and pacers to town on a regular basis and 2003 was no exception. Four American National winners went on to be named Dan Patch champions in their respective classes. The first 2003 American National was the $100,000 2-Year-Old Filly Pace on Saturday, July 18 and Dale Hiteman brought home Kikikatie to a 1:54.1 victory on an “off track” and she would go on to be the Dan Patch champion in her division. One week later the 3-year-old colt pacer Yankee Cruiser (Dean Magee), made it back-to-back American National championships when he cruised to a 1:50 flat clocking in that $285,000 stake for trainer Tim Pinske. 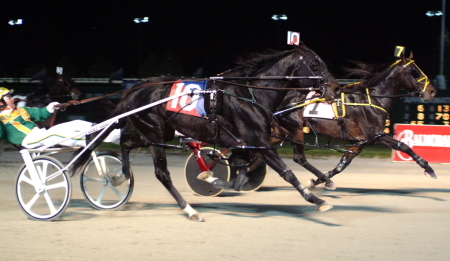 Yankee Cruiser also won the 2002 American National freshman pace. The next American Nationals, both 3-year-old trots, came about a month later, with the Chuck Sylvester Stable’s Mutineer taking the $200,000 colt event in 1:55 and Southwind Flanders (1:54.2) the $170,000 filly final, both driven by Eric Ledford. On September 27, a week after Super Night, a strong field was on hand for the $210,000 American National Aged Pace with the well-regarded Mcardle (Mike Lachance) going off as the 4-5 favorite. However he was parked-out to a 55 flat half and ended up fifth as Peruvian Hanover (Tim Tetrick) won a narrow head decision in 1:51.1 over the 63-1 longshot Color Me Best (Dave Magee. Mini Me, who would go out to be named the 2003 Illinois Harness Horse of the Year, finished third, only one length further behind. The last four 2003 American National championships all came on November 2 with the 3-5 favorite (Paul Mac Donald) winning the $140,000 2-year-old filly trot, the front-stepping Cantab Hall (Mike Lachance) the $150,000 for freshman male trotters and Dave Magee steering C C Spice (1:51.4) to an upset at 14-1 odds in the $215,000 sophomore filly pace. 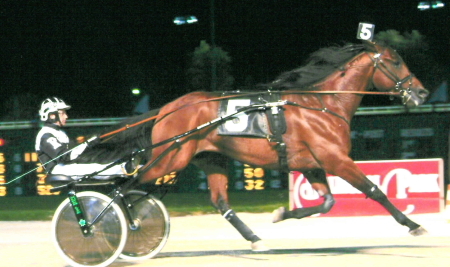 Cantab Hall would annex the 3-year-old colt trot Dan Patch title and also was named the 2003 Trotter of the Year. The headliner that Saturday was the $215,000 American National Aged Trot with all eyes on the nationally ranked 4-year-old Rotation from the stable of trainer Harold Lunde. Regular driver Trevor Ritchie settled the 1-2 choice into seventh in the early going while Magician (Ron Marsh) and Life’s Holiday (Homer Hochstetler) battled to a 55.2 half. Rotation came from third-over, overtaking Magician in the lane and pulling away to a 1:53.1 victory. Rotation finished the season with over $875,000 on his card with victories in his last three starts—the $630,110 Maple Leaf Trot, the $104,000 Allerage and the $215,00 American National. Earlier he captured the $450,000 Nat Ray at The Meadowlands and was named the Dan Patch Aged Trotter of the Year. Fifteen years have passed since then and regrettably so have the days of national star pacers and trotters coming to Illinois.